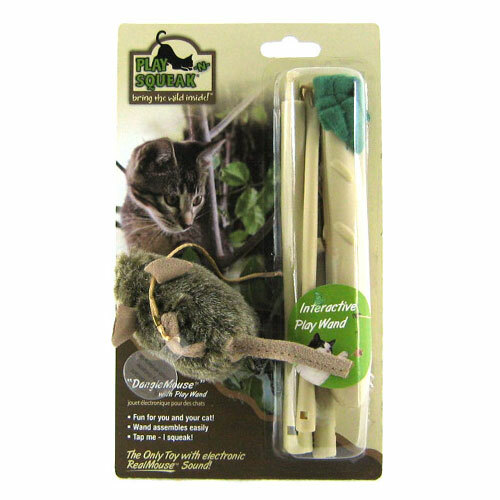 Play-N-Squeak Dangle Mouse with Play Wand Cat Toy features an electronic sound module that produces an amazingly realistic mouse squeak that cats love. Cats love stalking and pouncing and are keenly attracted to movement, so slowly drag the "Dangle Mouse" on the floor and arouse the pounce, then dangle it above her head and double her delight! Play-N-Squeak cat toys are perfect for healthy mental and physical stimulation. It keeps them alert, agile and healthy. Shipping weight: 1/5 lb. Well, I bought this for my 80-lbs dog, Chessie. She absolutelys LOVES this toy. When the mouse squeaks, her eyes get as big as saucers and her tail wags incessantly. The only thing I wish is that they made this toy sturdier (for dog's) because my dog can be a little rough, and eventually she "kills" the mouse's squeaker inside.